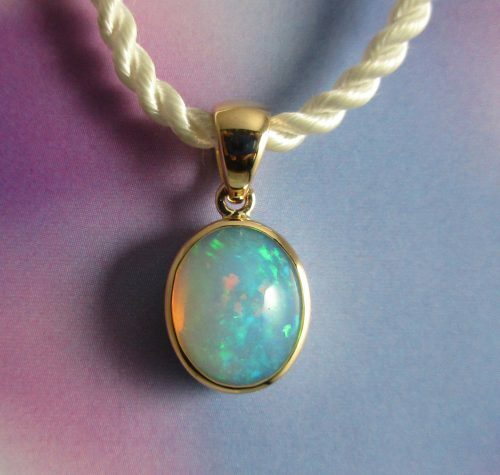 This pendant is the perfect combination of natural and flashy. Each pendant in the Earth Gem series features a smooth stone as the main focus (all mined in the USA) with a faceted gem set in a silver bezel. 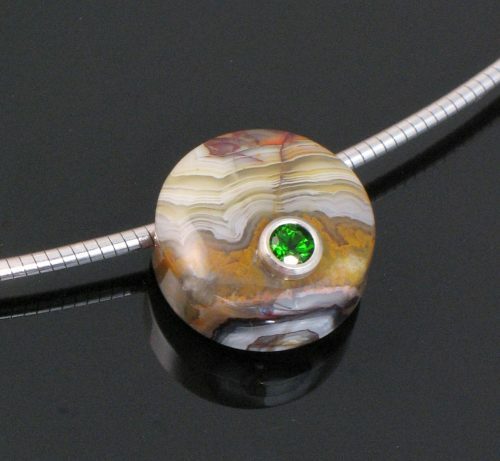 The stone has been drilled through and can be worn on chain or cord; singly or with other Earth Gems. This is the smaller size of Earth Gem 18mm diameter. The main stone is Laguna Lace Agate. The faceted stone is Imperial Chrome Diopside. Nature does much of the work mining Imperial Diopside. The forbidding Siberian mountains where this rich green gem is found are covered by deep snow from October to June. The winters are so harsh that the ice cracks and shapes the ground and rocks. When the snows finally melt in the summer, the green of diopside crystals can be found on the surface of the ground like a blanket of rich green moss. The sparkling crystals are washed down in the rains and sparkle on the mountainsides and riverbeds like green frosty dew. Trigem Designs? is part of Columbia Gem House Inc, a vertically-integrated gemstone mining, cutting, and marketing company founded by Eric Braunwart in 1977. 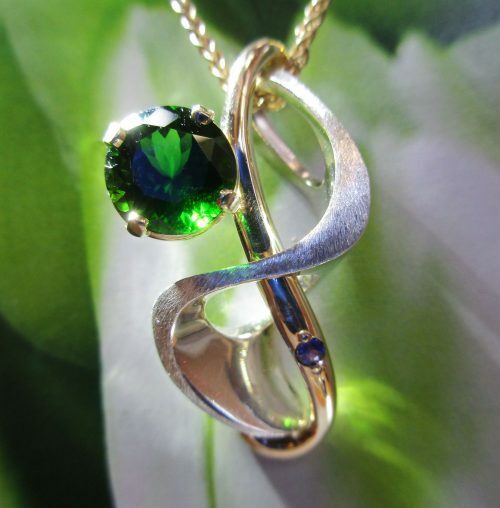 Trigem Designs creates designer jewelry featuring gemstones, manufacturing each piece in the company’s U.S. headquarters in Vancouver, Washington. 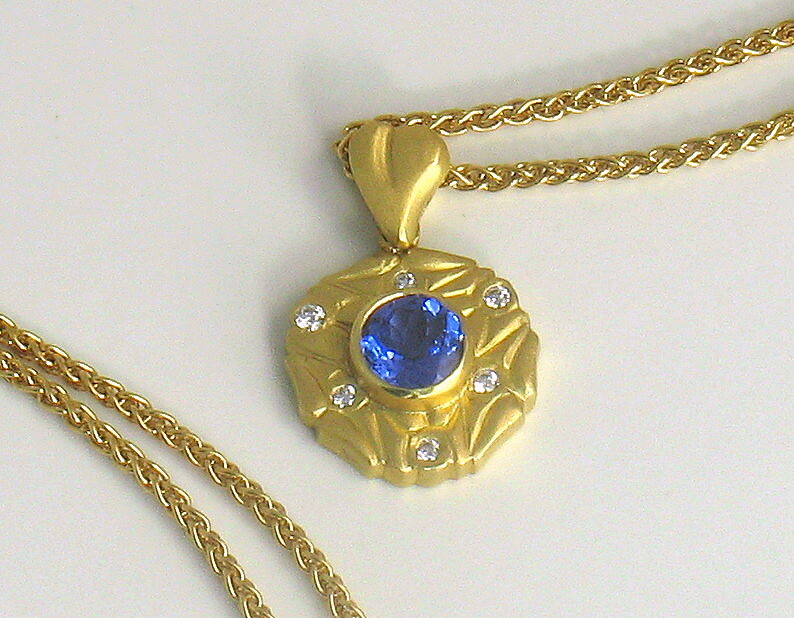 This makes Columbia Gem House, Inc. one of the few companies in the world that can take a gemstone from the mine to the finished jewelry design.